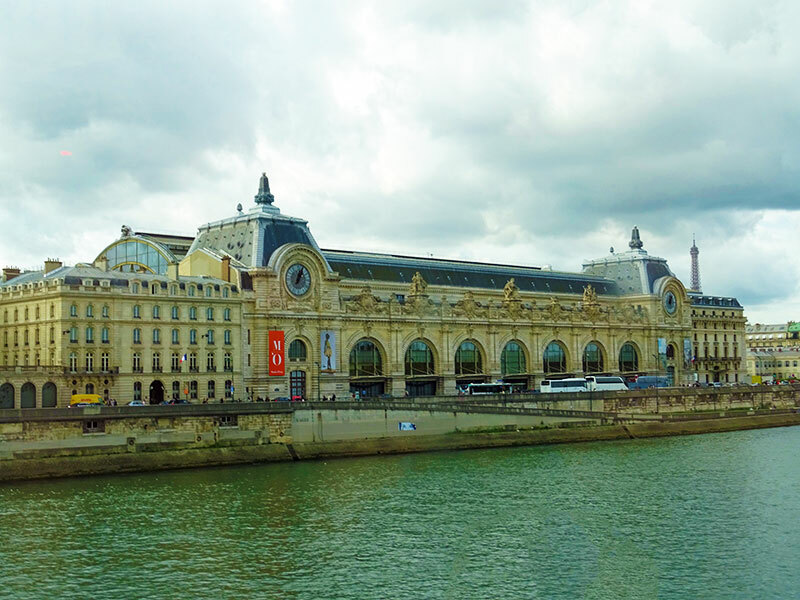 The Sightseeing Tour of Paris and Louvre (on your own) departed the Port of Le Harve, France at 8:45 am. On the journey, our guide talked about the Statue of Liberty. 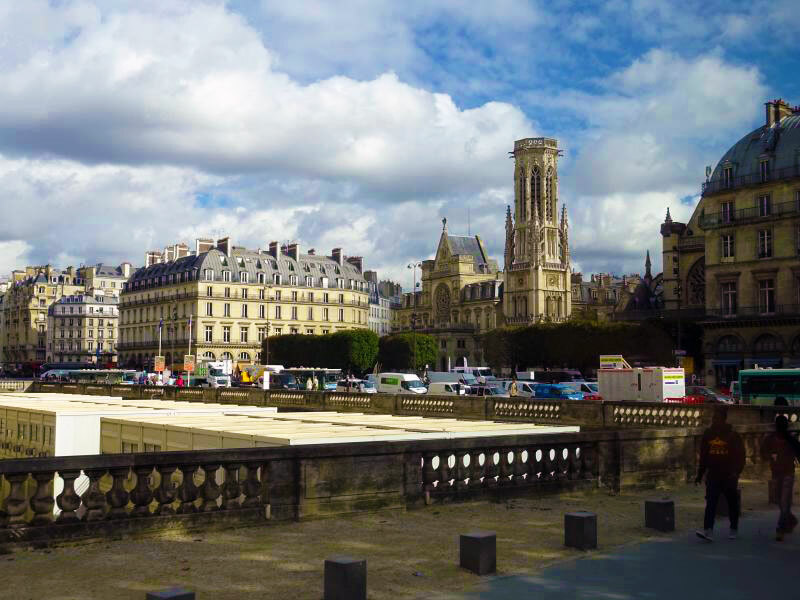 A quarter-scale copy of the powerful figure rests on the man-made Isle of the Swans on the River Seine. 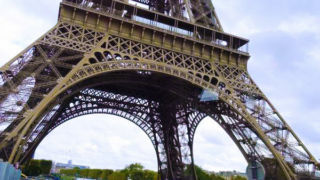 During the World’s Fair in 1937, the Paris city government altered the statue’s direction from facing the Eiffel Tower to facing New York City. 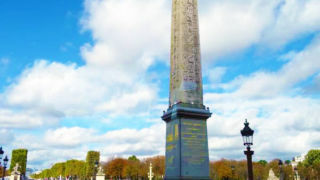 The full-scale version of the monument shipped from France to the U.S. in 350 individual crates. As we passed through Normandy, we learned that Vikings raided the area during the 9th century. Rollo, the 1st Duke of Normandy, took lands from King Charles in exchange for protection against future Viking assaults. We took great interest in this narrative as we recently saw the History Channel’s adaptation of Viking’s and had learned much about Rollo. 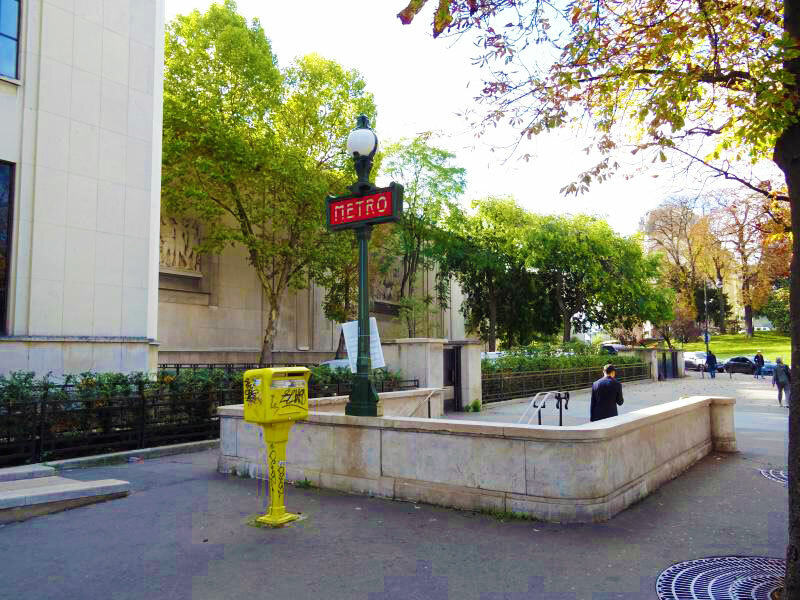 During the trip into the city, our guide spoke of France’s famous toasted ham and cheese sandwich. The French snack called Croquet-Monsieur is a baked or fried, boiled ham and cheese sandwich. 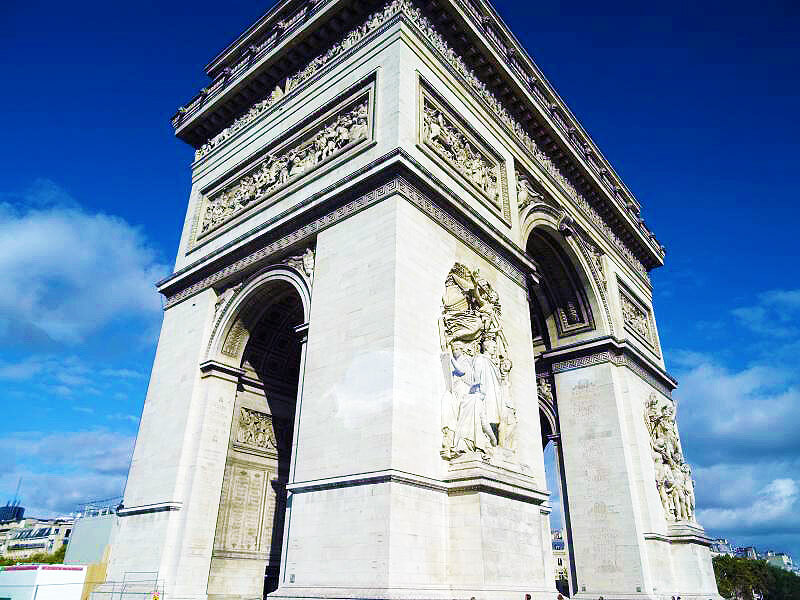 We learned the dish originated in the Paris region and emerged on cafe and bar menus around 1910. Unfortunately, we did not have the chance to seek out the bistro-style sandwich, but it is on the list for our next visit. 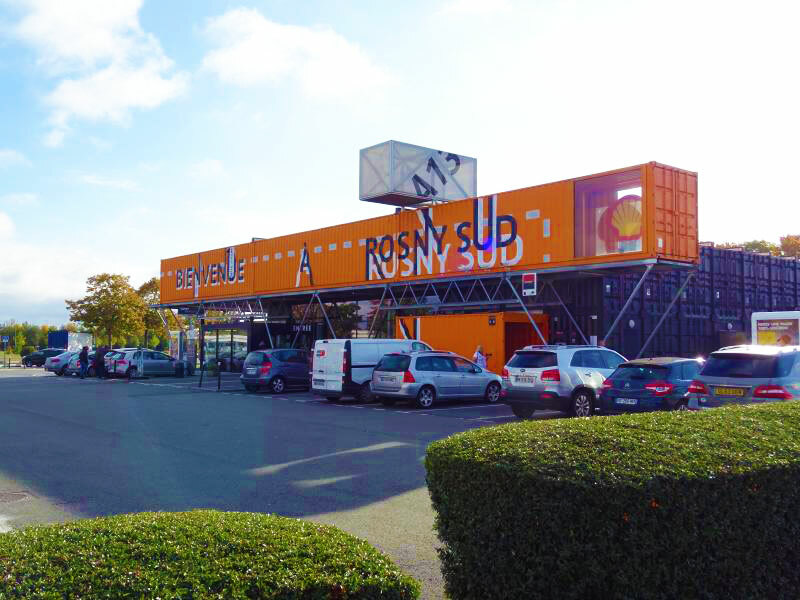 Our bus made its first stop for a 20-minute restroom break at 10:25am at the Rosny Sud 413 Shell Station and Convenience Store. The facility offered a variety of drinks and snacks, including some tasty Pralines which I purchased. 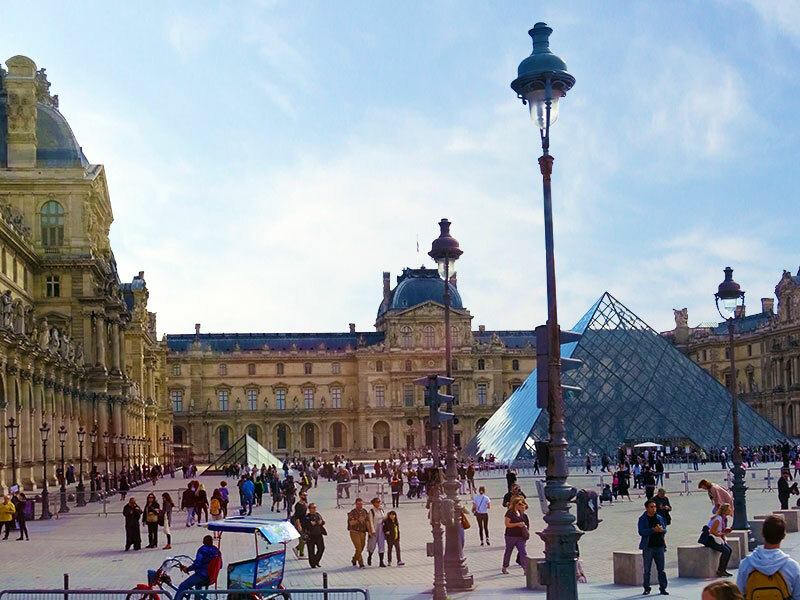 Once back on the bus, our guide shared the history of the Louvre. 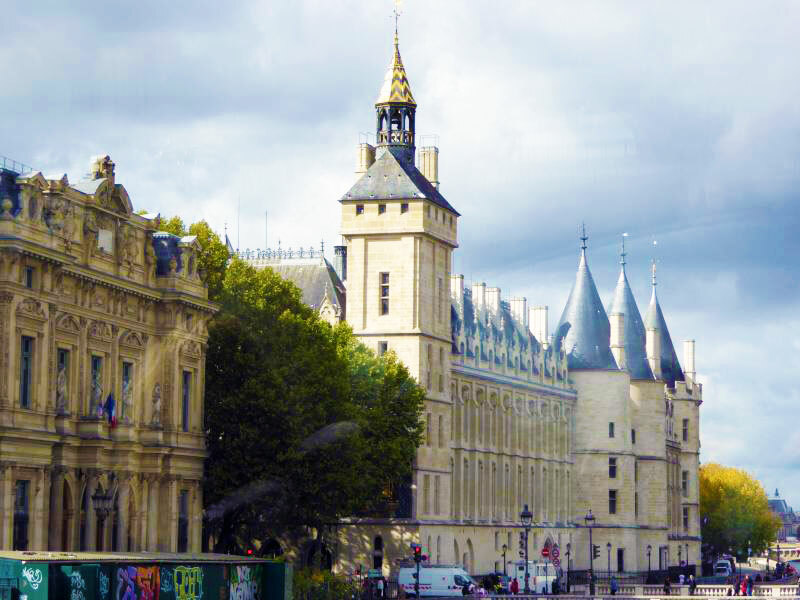 In 1190, the Paris government built a wall around the city for security. 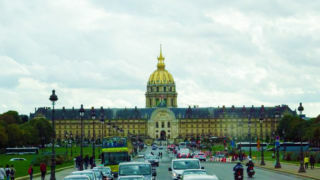 The Louvre, a military fortress at the time, lay outside the walled in area. 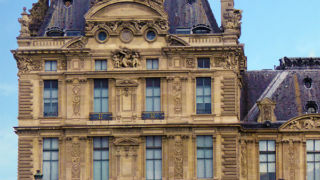 Urban expansion eventually constituted the need to modernize the wall, and the Louvre now fell within the city and over time, lost its military purpose. 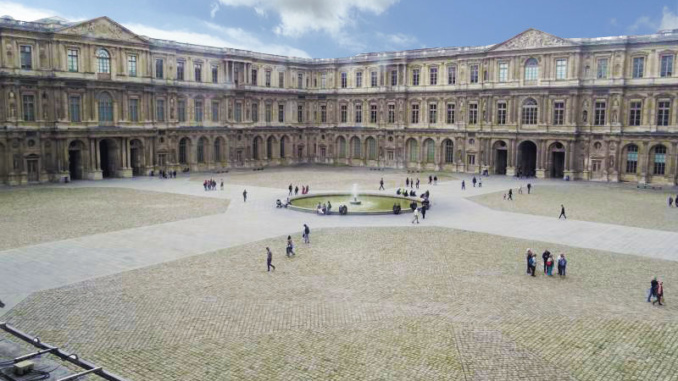 In 1546, Francis I converted the Louvre into the primary residence for French Kings. 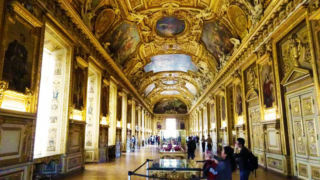 It became home to King Louis XIV, who resided at the Louvre until his departure for Versailles in 1678 before its ultimate re-purpose as a museum. 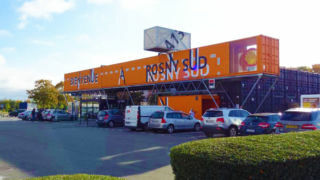 Our pitstop - Rosny Sud 413 Shell Station and Convenience Store. 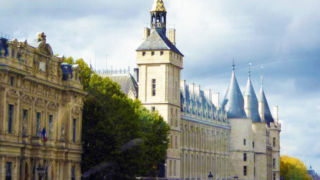 The buildings of the Conciergerie which are used as courts of law today were once a prison attached to the Royal Palace. 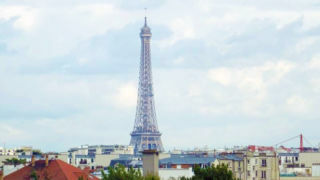 Our first look at the Eiffel Tower as it appeared to rise out of the city streets. 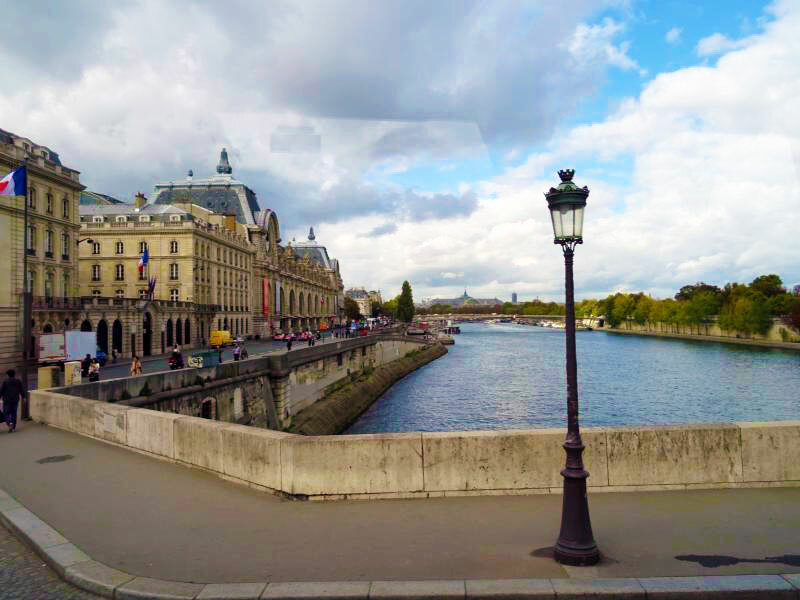 Our first views of Paris occurred around 11:15am with our arrival in the 16th Administrative District. 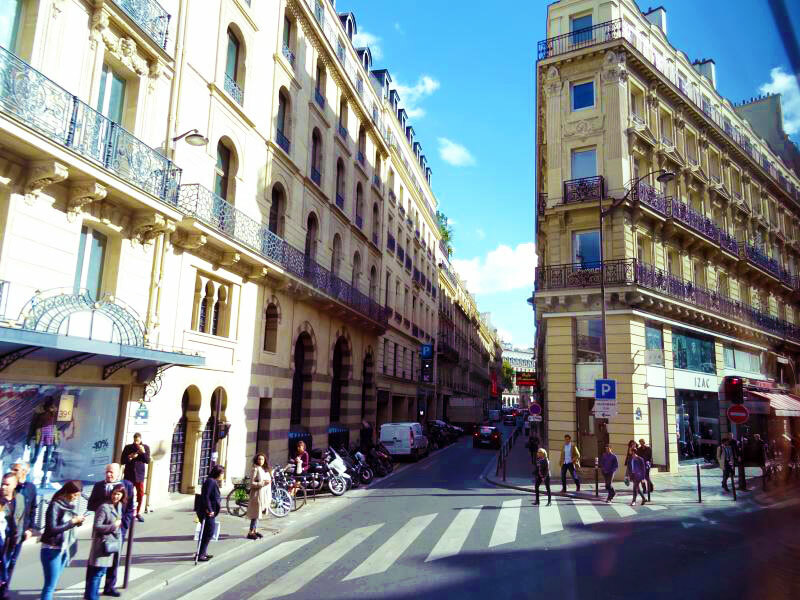 Twenty of these districts divide the City of Paris in total. At 11:30am, we got off the bus for 15 minutes of sightseeing. 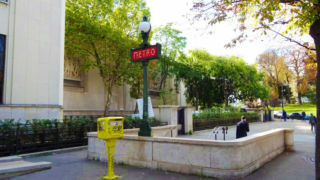 The bus stopped at the Trocadero Metro stop (lines 6 and 9). 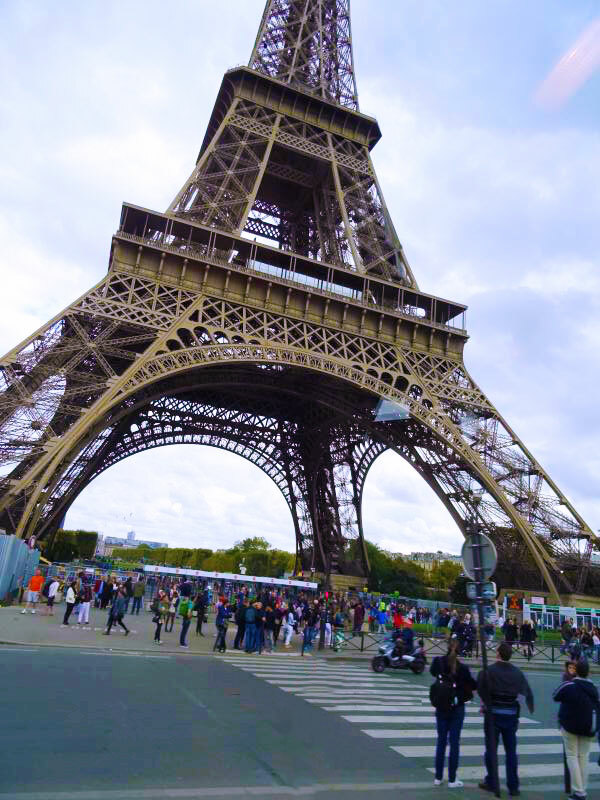 From the drop off spot, we crossed the street to take in the best view of the Eiffel Tower. 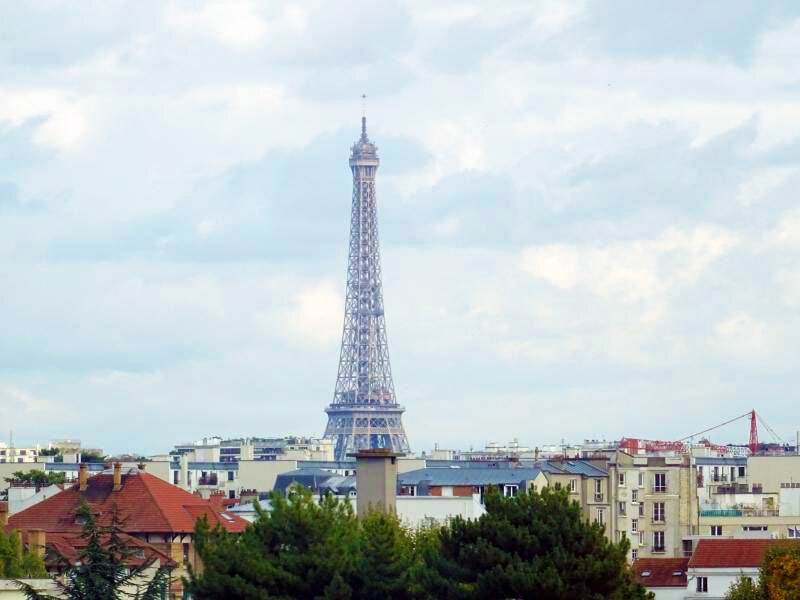 Our vantage point was on the opposite side of the River Seine from the monument and sits high enough that it yields a tremendous, unobstructed view of the structure. Unfortunately for us, the position of the sun made it troublesome for the camera to focus well on the Tower. 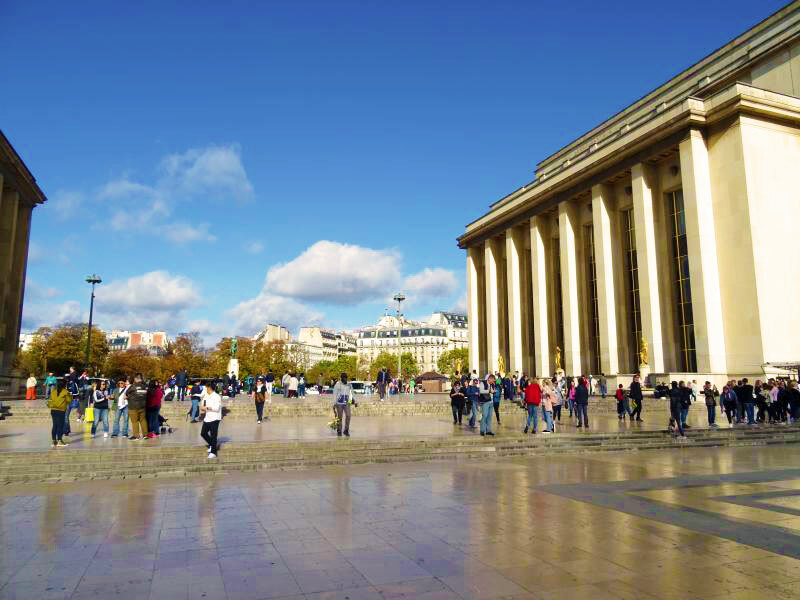 We wandered around the large square a few minutes, and then we returned to the bus for the rest of our city tour. 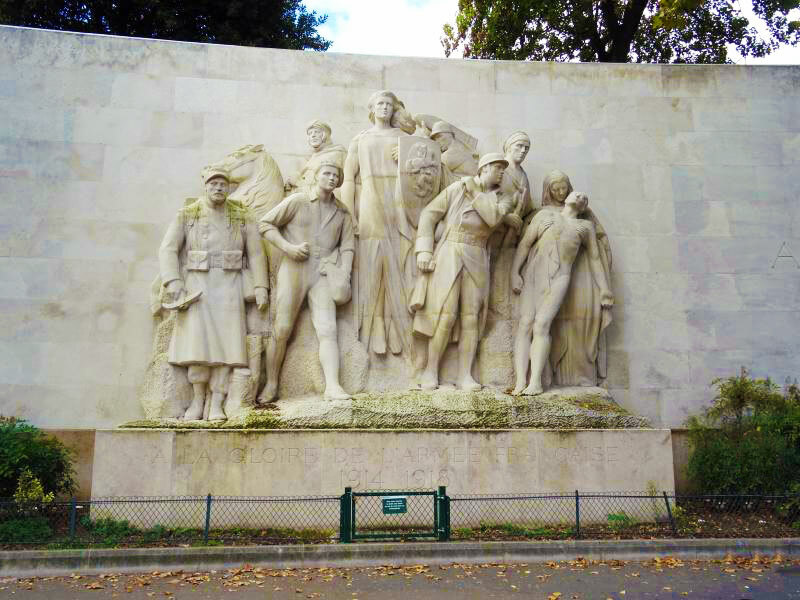 The monument of Paul Landowski, Trocadero Square, a tribute to the French Army of 1914 - 1918. 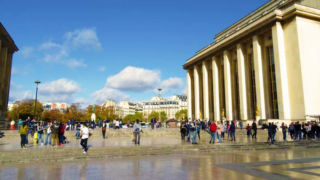 The open area of Place du Trocadero between the Homme Museum and the Museum of Architecture and Monuments. 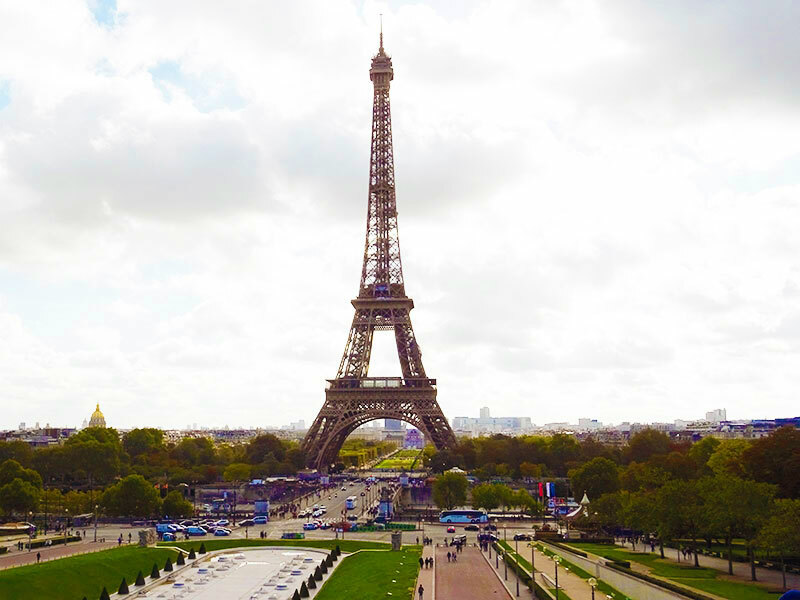 The beautiful Eiffel Tower from the Place du Trocadero plaza. 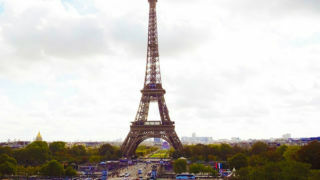 The Eiffel Tower from our bus as we drove through the city. 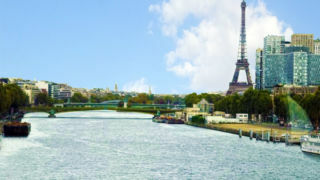 A nice view of the Seine River, the Paris business district, and the Eiffel Tower. 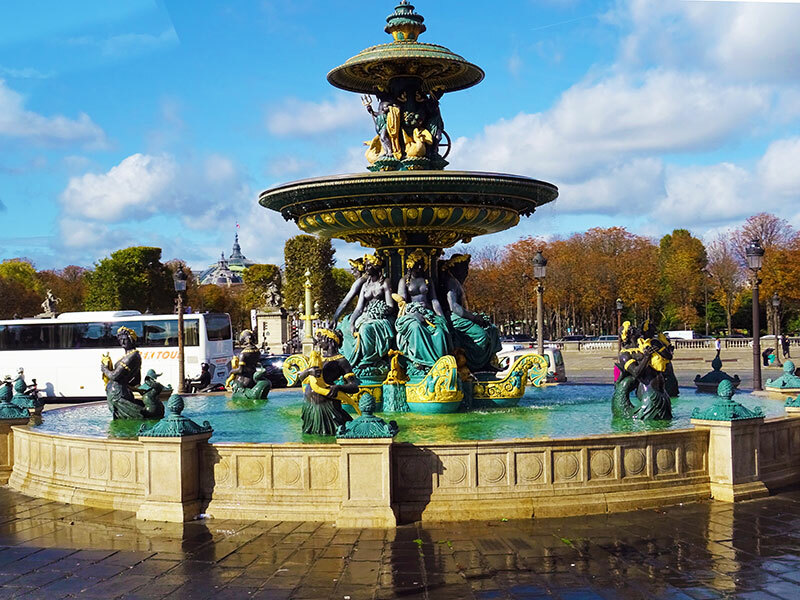 To the dismay of many passengers on the bus, our guide continued to follow the tour guidelines specifying that we have a Sightseeing Tour of Paris. 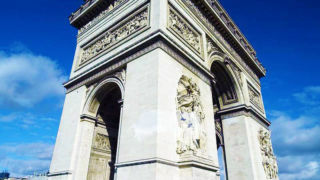 Accordingly, we now traveled around the city viewing many of the notable landmarks. 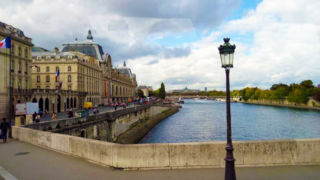 Some of the noteworthy places we rode by were the Academy of Music, Arch de Triumph, Madeline Church, Luxor Obelisk, Hotel De La Marine, Fountain of River Commerce & Navigation, the Caesar & Silver Tower of Conciergerie, and the National Residence of the Invalides. 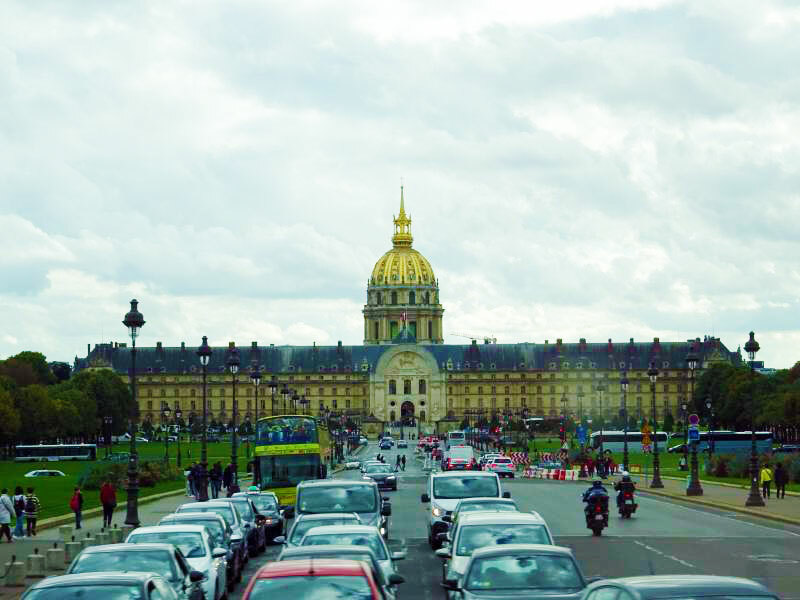 Due to the distance of the sites and the traffic on the streets, 1 hour 35 minutes transpired before arriving at the Louvre at 1:20pm. 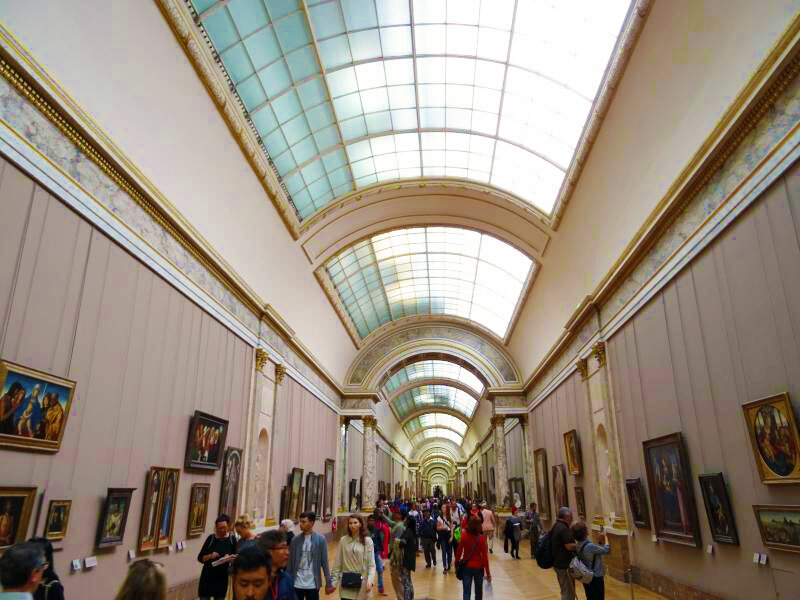 Regrettably, we had only 2 hours and 10 minutes in total to spend admiring the mammoth collection of artwork in the Louvre. 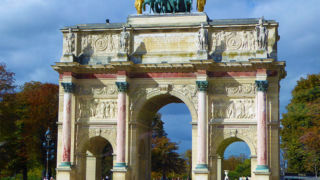 Arc de Triomphe de l'Etoile, inaugurated in 1836, located at the Place Charles de Gaulle. 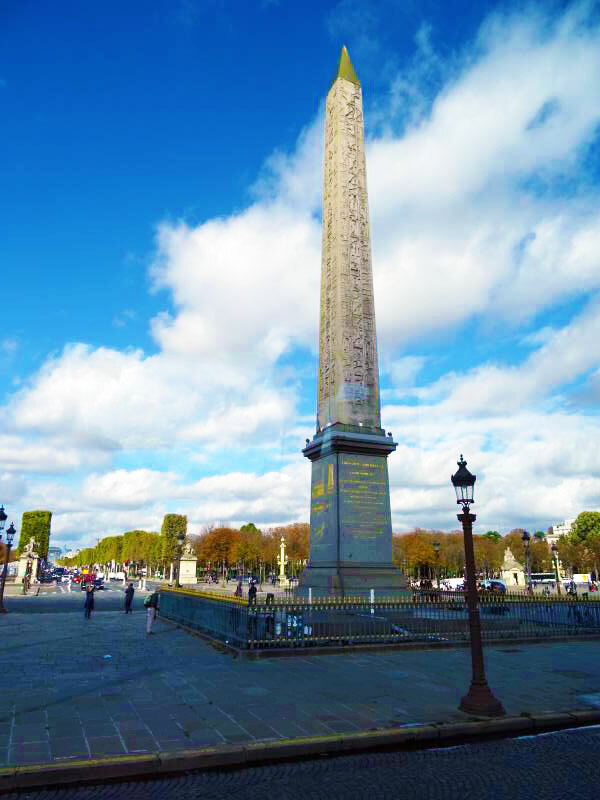 The Luxor Obelisk, dates back 3300 years and was a gift from the Egyptians to France. 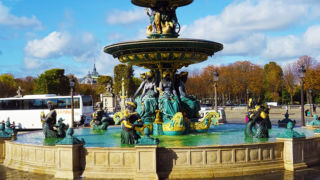 A fountain at the Place de la Concorde, dedicated to maritime France and the sea. Les Invalides, built in 1670, is a series of buildings containing museums and monuments relating to the military history of France. 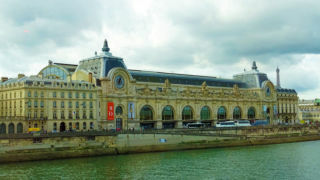 Musee d'Orsay, built in 1898, is a railway museum. The building was in use as an active railway station until 1939. 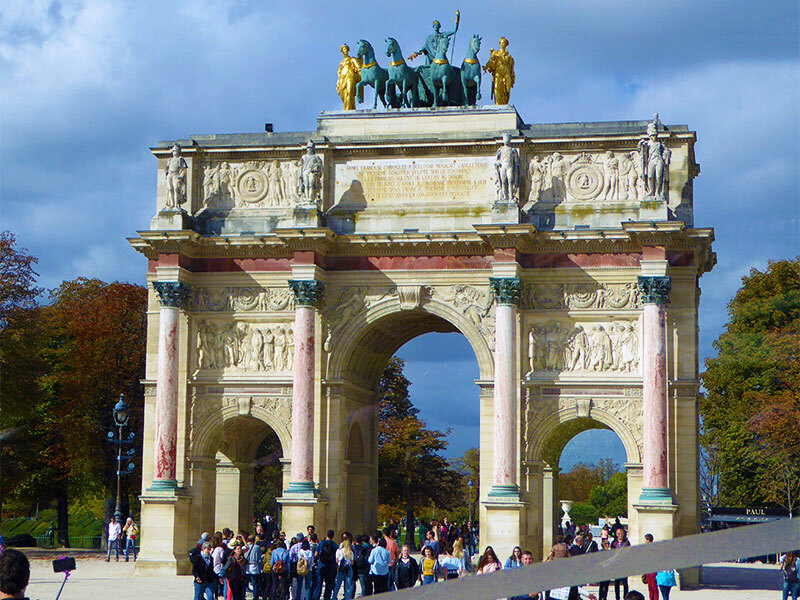 Arc de Triomphe du Carrousel, completed in 1808, commemorates Napoleon's military victories. 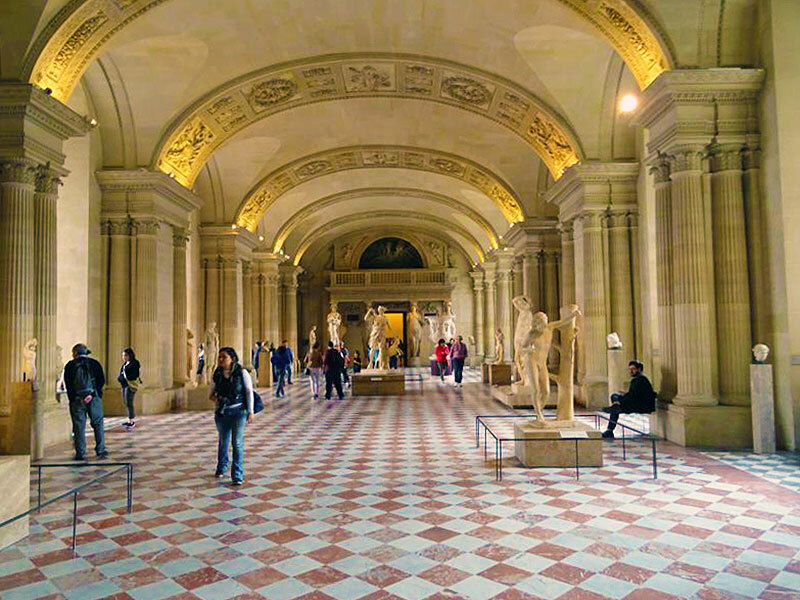 One of the oldest sections of the original Louvre Palace. 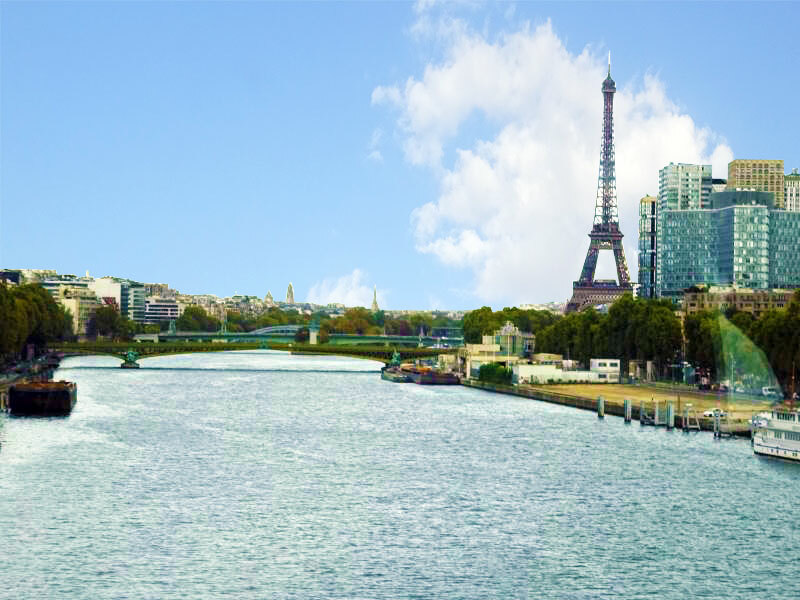 A beautiful view of the Seine River. 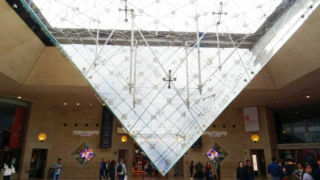 Our meeting place was the inverted pyramid in the underground complex of the Louvre. 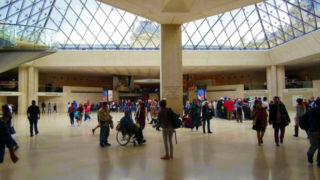 Upon entering the Louvre, we presented a ticket furnished by the Tour Guide and then went through a security screening. Once inside, we set our bearings and started towards our first destination, the Mona Lisa. We followed the sparse signs to the area displaying the painting. Luckily the popular exhibit hangs in a huge room that holds hundreds of people, so no waiting in line to grab a quick photo. 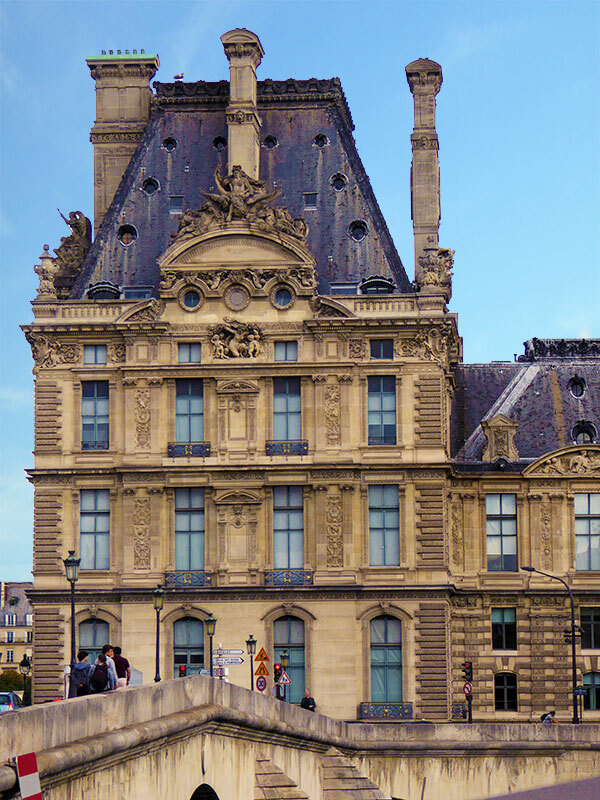 The front of the Louvre showing only a small portion of the vast complex of buildings. 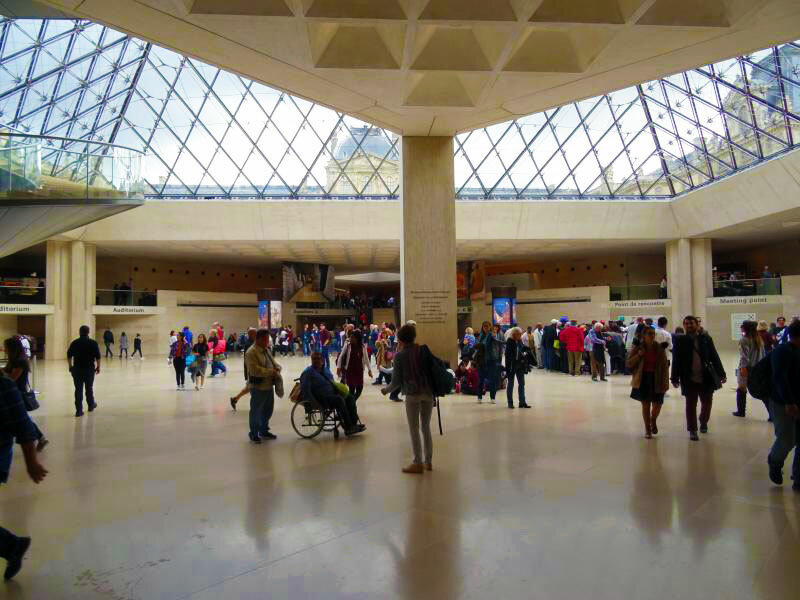 The lobby of the Louvre below the glass pyramid. 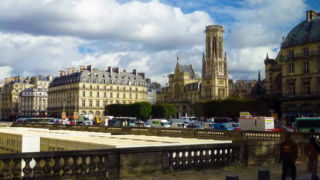 The Saint-Germain-l'Auxerrois church surrounded my retail businesses and museums. 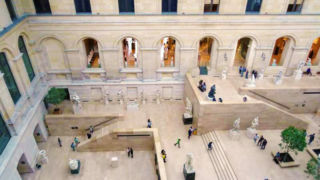 The Louvre is dividend into three distinct sections. 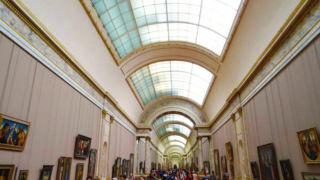 The Denon section holds the Mona Lisa and other European paintings. The Sully section has a great collection of Egyptian Antiquities. 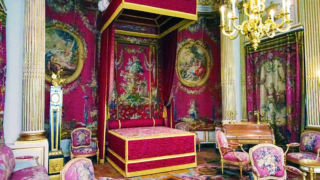 The Richelieu section displays European decorative arts and the Napoleon apartments. 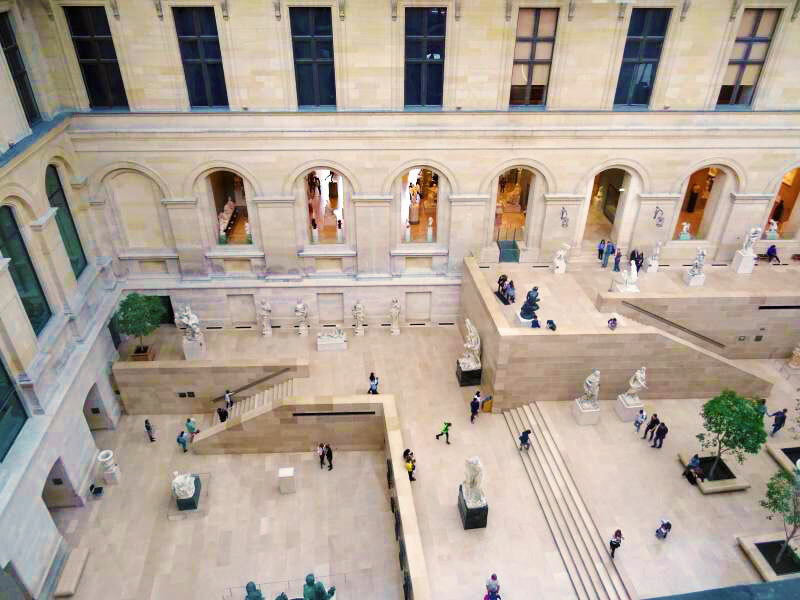 We hastily moved about the Louvre and saw all three sections to some degree. 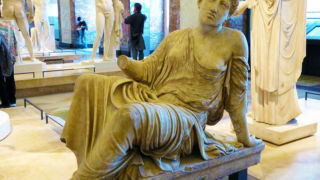 Some of the notable sights we visited include: the Mona Lisa, Victory of Samothrace, Venus de Milo, Seated Scribe, Sleeping Hermaphrodite, Old Centaur with Cupid (Sagittarius), Great Sphinx of Tanis, Tapestry of The Sacrifice at Lystra, Collection of Sarcophagus, Dama de Tacheretpaankh Cellini Benvenuto Shield, Statue D’Arhena, and the 17th & 18th Century Decorative Arts Galleries to include Marie Antoniette’s Room. Not too shabby for a 2-hour 10-minute visit. 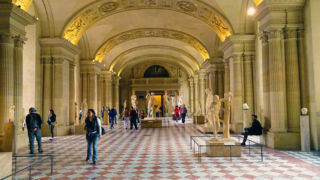 Hall of Caryatides, a room in the Sully Wing of the Louvre. 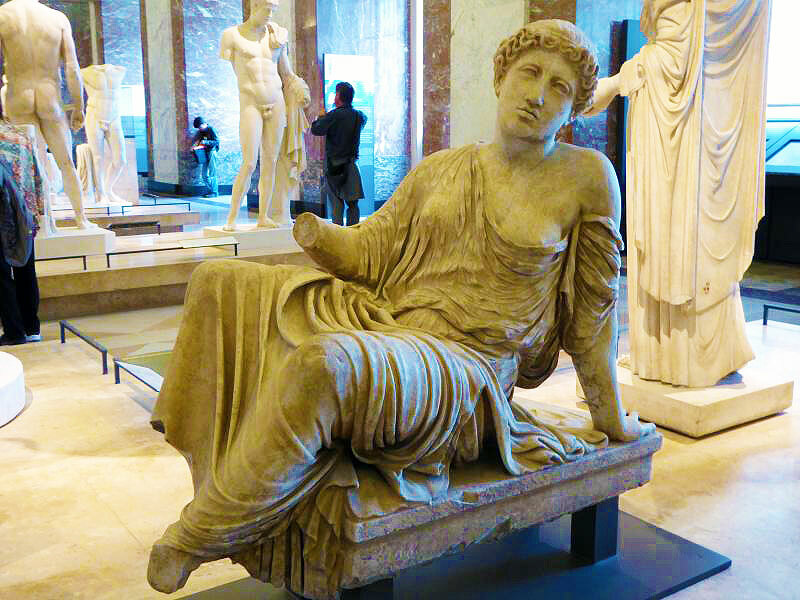 Sculpture in the Greek, Etruscan and Roman Antiquities section of the Louvre - lo ou Callisto, Suppliante Barberini. 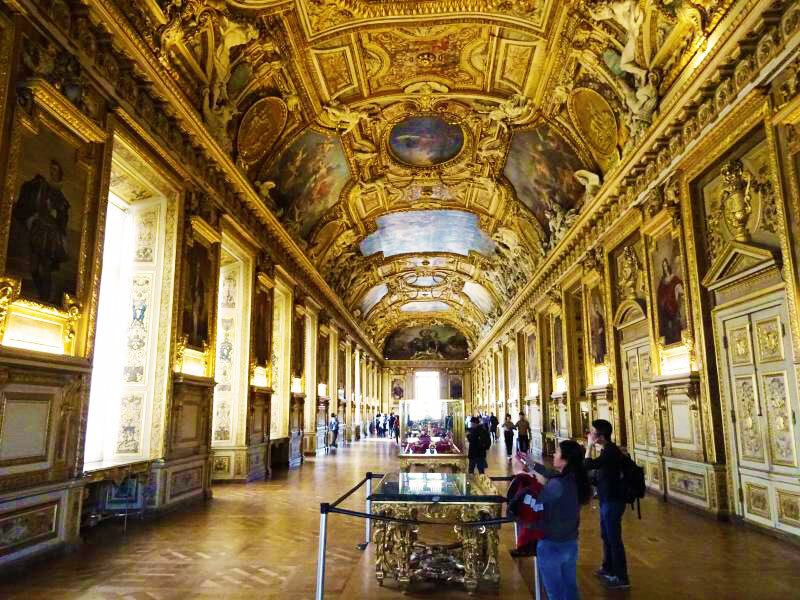 The Galerie d'Apollon at the Louvre was used as a model for the Hall of Mirrors at Versailles. 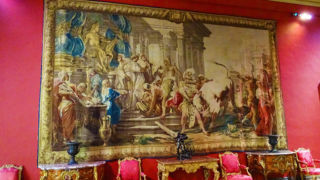 One of the many wondrous tapestries hanging at the Louvre which depict stories from Greek Mythology, Political Satire, and other major events in history. 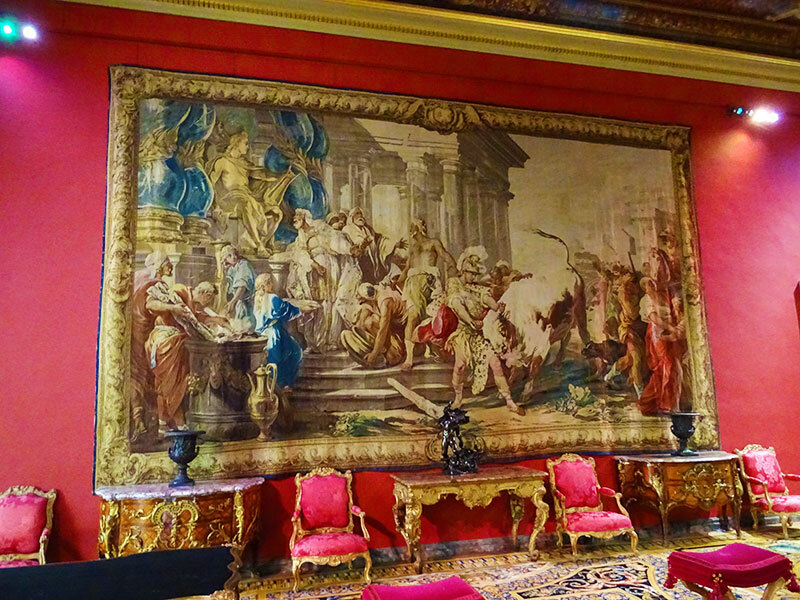 The Great Hall of Paintings. 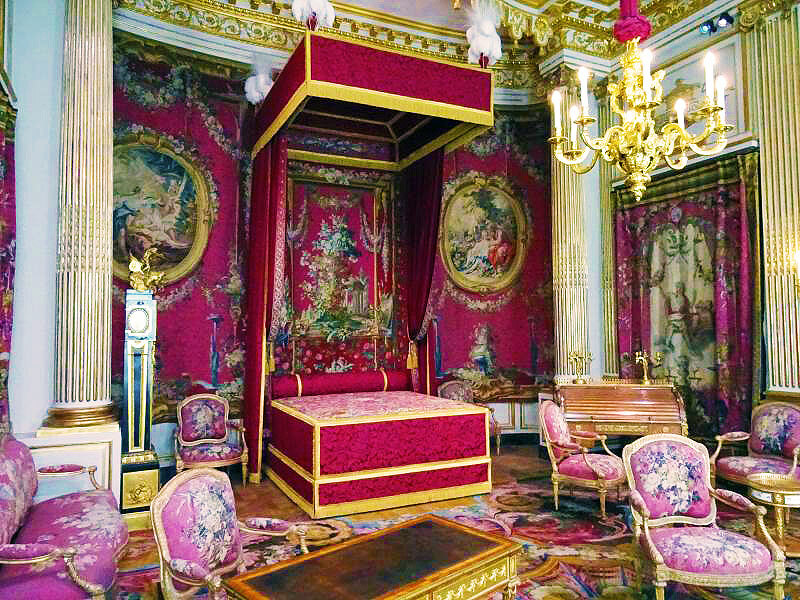 The King's Bedroom - a part of the Napoleon III Apartments exhibit. 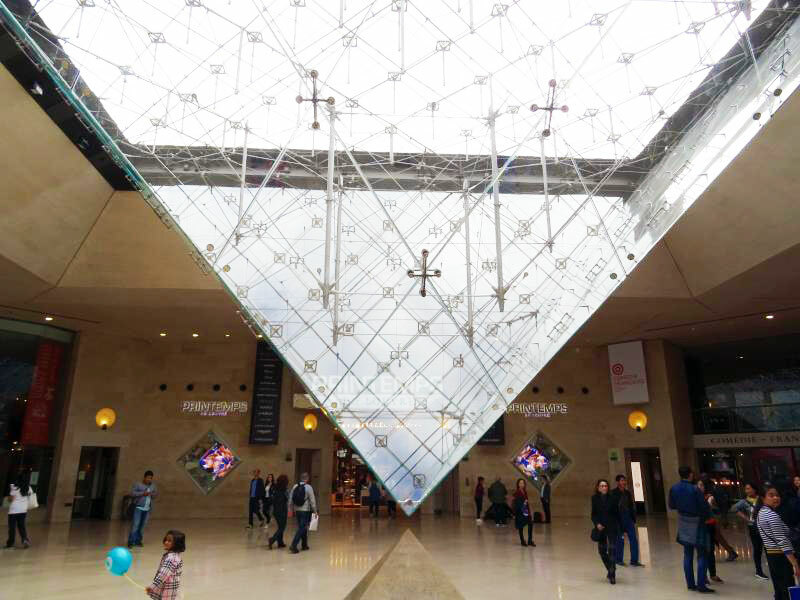 As our time at the Louvre wound down, we began making our way from the Richelieu building to the inverted pyramid in the underground. The course seemed straightforward enough on the map but became challenging as we navigated back through the many rooms. After proceeding through many sections, we encountered a museum attendant who offered us a few quick directions. We finally made it back to the meeting point with several minutes to spare. 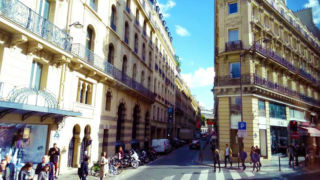 One item to mention, we got a much better response from the French locals when we started off with a sincere Bonjour. 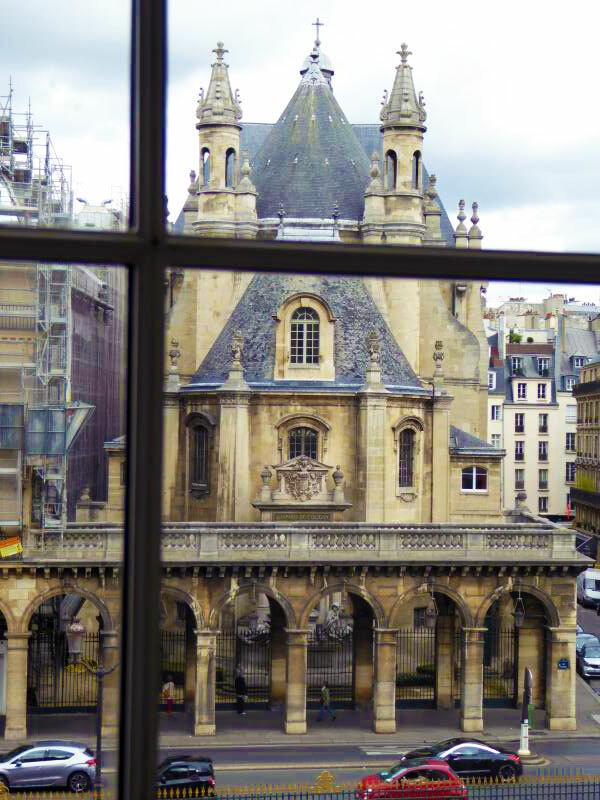 A cool view of the Reformed church in Paris looking out a window of the Louvre. 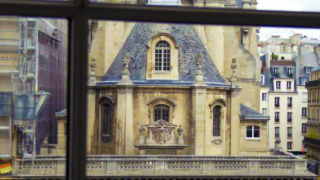 Looking down on the Sculpture Hall. 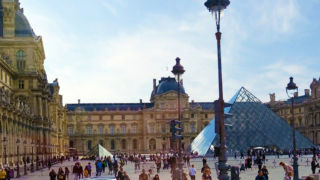 One of the interior entrances to the Louvre and our meeting point for the tour group. Departure from the underground bus Depot was at 3:45pm. Our French tour guide did not return to the port with us. The left side of the bus turned into the sunny side on the return leg. We arrived at the port of Le Harve at 6:30pm. 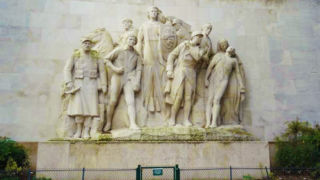 All in all, we had an excellent day, but 6 hours of travel to and from Paris, limited the experience.